Dr. James Porter is director of surgical robotics at Swedish Medical Center in Seattle, Washington. He is former Associate Professor of urology and head of laparoscopy and robotics in the Department of Urology at the University of Washington Medical Center. His area of expertise and is robotic assisted prostatectomy and partial nephrectomy. He has pioneered the retroperitoneal approach for robotic renal surgery and retroperitoneal lymph node dissection for the treatment of testicular cancer. He has been director of a fellowship in robotic and laparoscopic surgery for the last 13 years. 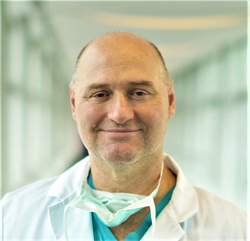 He is considered the most experienced laparoscopic and robotic surgeon in the Pacific Northwest and has performed over 3,000 robotic procedures. He earned his undergraduate degree in biochemistry at Ohio State University. He received his medical degree from the Medical College of Ohio and did his urology residency at the University of Washington Medical Center. He did advanced laparoscopic training in Heilbronn, Germany under the direction of Dr. Jens Rassweiler. He is currently president of the Society of Urologic Robotic Surgeons.